According to their van, they are supporters of a pro-unification, pro-PRC group called 中華愛國同心會 a.k.a. „Concentric Patriotism Association of R.O.C.“. Probably, they are the same ones driving through town with a PRC flag on their cars and speakers blaring from time to time. On their banners, they attacked Bruce Chung (鍾鼎邦), the Taiwanese citizen and Falun Gong practitioner who has been arrested in China more than a month ago. They accuse him of being a spy sent by Falun Gong, and that the arrest serves him right. Note the exclusive use of simplified Chinese characters. There was no shouting or pushing. Police seemed determined and in a no-nonsense mood. 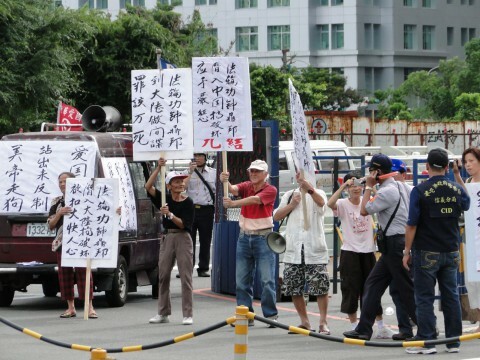 No one from the Falun Gong side crossed the road to confront these people. The parade continued peacefully towards Freedom Square, where it ended with a candlelight vigil. 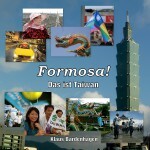 Do you know how long this group 中華愛國同心會 have been active like this in Taiwan? I have been to the National Palace Museum (NPM) a few days ago. There were abt. 20 Falun – Dafa people meditating, a few persons were handing out leaflets. I think this is a good chance for them to let tourists from China know, how bad they are treated by the Chinese government. Anyway, since they were on the NPM premises, two police officers tried to convince them to move away. – I didn’t saty long, so can’t tell the outcome. In front of Taipei 101, initially the building management also wanted them to leave. But then they could prove that they are on public grounds, not on the shopping mall’s outside area.